Global waterproofing membranes market share is predicted to surpass USD 10.5 billion by 2024 owing to its applications in building structures, landfills & tunnels, roofing, and walls. Extensive use of durable materials in the construction sector to protect structural slabs, vertical walls, parking, and foundations is predicted to fuel the demand for waterproofing membranes over the next few years. Large-scale availability of raw materials coupled with favorable properties such as UV resistance, high flow rate, and UV resistance is predicted to boost the industry growth trends over the coming years. Waterproofing membrane industry size worth over USD 6.5 billion in 2017, is predicted to exceed USD 10.5 billion by 2024, growing at a CAGR of around 7% over the period of 2018-2024. It finds applications in waste management & water management industries. Global waste management industry worth USD 410 billion in 2015 and projected to touch USD 570 billion mark by 2024, is expected to boost the market demand over the forecast timeline. Waterproofing membranes find applications in the construction sector owing to its repellant property that makes the structure resistant to the constant climate changes. However, variations in the crude oil costs are predicted to affect the supply of the key raw materials like bitumen and propylene and this factor can hinder the market growth over the coming years. Polymer modified cement waterproofing membrane market is predicted to witness a noticeable growth over the forecast timeline owing to its wide applications in subway systems, tunnels, effluent treatment plants, railways, dams, and parking structures. Bitumen waterproofing market is predicted to grow at a rate of around 6.5% over the period of 2018-2024. Polymer waterproofing membrane market size worth over USD 3.2 billion in 2017, is predicted to witness a noticeable growth over the forecast timeframe due to the beneficial properties like water vapor permeability, flexibility, water resistance, and full surface adhesion. In addition to this, it is used for treating porous surfaces to halt the water movement through the substrate. Sheet membranes application segment is anticipated to record a CAGR of around 6% over the period of 2018-2024 owing to its application in kitchen floors, walls, wet rooms, balconies, bathrooms, and roofs as a result of its safety features coupled with low maintenance costs. Liquid applied membranes application worth over USD 4.5 billion in 2017, is predicted to witness a substantial growth over the forecast period owing to its use in roofing applications because of beneficial characteristics such as durability and elongation. Waterproofing membrane market share in the roofing systems worth over USD 1.8 billion in 2017, is predicted to witness a noticeable growth over the forecast timeframe owing to its high load bearing capacity along with heat resistant property. Water proofing membrane market in the building structure industry is predicted to witness a substantial growth over the forecast timeframe as it helps in improving the shelf life of buildings and protect the building structures from weather changes. 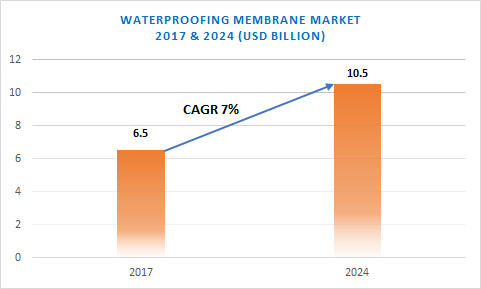 U.S. waterproofing membrane market is expected to exceed USD 980 million mark by 2024, growing at a CAGR of around 5.5% over the period of 2016-2024 driven by strict government legislations to enhance the production of bio-based polymers to meet the product demand for different applications. Germany waterproofing membrane market worth over USD 520 million in 2017, is anticipated to witness a surge over the forecast timeline owing to the favorable legislations regulating the production of polymer-based products like biopolymers significantly contributing towards a green environment. Brazil waterproofing membrane market is predicted to witness a substantial growth over the forecast period owing to increase in expenditure on construction. UK market is predicted to record a noticeable growth over the forecast timeframe due to growing concerns over waste and water management. 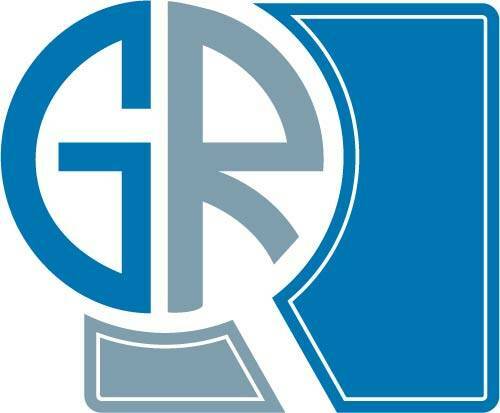 China waterproofing membrane market is expected to surpass USD 1 billion by 2024 primariily due to growing industrialization coupled with the infrastructural developments. Furthermore, demand for waterproofing membrane in mining industry is likely to contribute significantly towards the regional growth. Key industry players include Sika AG, BASF, Fosroc, DOW Chemical Company, CICO Technologies Limited, DuPont, Pidilite Industries, and Covestro.